Dusit International confirms the opening of Dusit Thani Maldives on 6 February 2012. Surrounded by a vibrant 360-degree coral reef and turquoise lagoon, this island property features pearl white sandy beaches and a rich landscape of verdant vegetation. 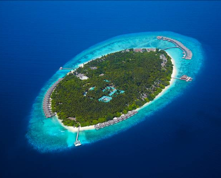 Dusit Thani Maldives is considered a landmark addition to this fast expanding brand. Located on Mudhdhoo Island in Baa Atoll, Dusit Thani Maldives is 35-minutes by seaplane from the capital Malé, Blending Maldivian architecture with Thai artistry, the 100-villa resort features Dusit’s signature Devarana Spa, uniquely elevated above a grove of coconut palm trees. The resort’s centrepiece is the expansive infinity swimming pool, the largest in the Maldives, a full 750 square metres designed around an ancient banyan tree. Dusit Thani Maldives is an ideal haven to explore the marine biodiversity of Baa Atoll, the first UNESCO World Biosphere Reserve in the country. An accomplished chef with extensive experience garnered while working in five Michelin-awarded restaurants in Spain, Chef Jaume has designed new concepts for the three restaurants and two bars on the resort. Benjarong is Dusit Thani’s signature Thai restaurant, Market creates classic favorites all day and the Sea Grill serves ocean catch, working with local fisherman to promote sustainable fishing in the Maldives. Supervising a staff of 50, Jaume focuses on simplicity, pure food and holistic dining. Some of his favorites creations are detoxifying menus for breakfast and cooking in the sand, a unique dining experience on the beach.